Nick Jonas Is 'Shooting Something' And We Wonder If Its Another Jonas Brothers Track! Are the Jonas Brothers shooting video for the next track from their album? Because they are definitely shooting something together and sending their fanbase in a tizzy! 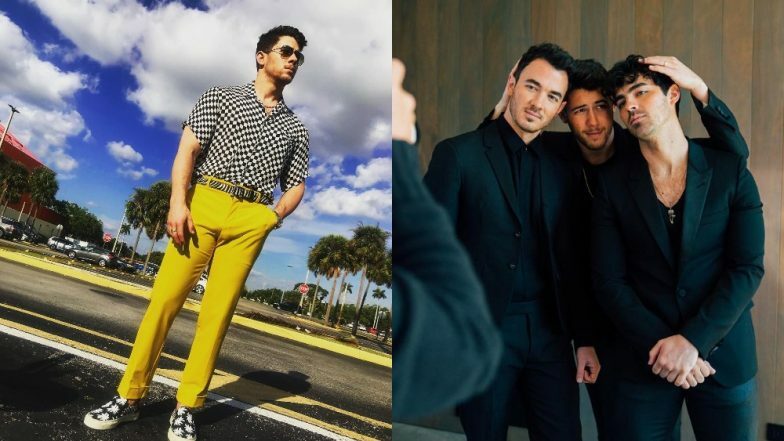 Over the weekend, they teased a new music video on their Instagram stories where Nick Jonas and Joe Jonas were spotted wearing matching outfits. Although we didn't get a look at the story, E! News confirms that Nick and Joe were seen wearing matching outfits comprising of a navy blue sport coat and a white shirt with black trim. Nick further said in the video, "B---h stole my look." This has got us pretty intrigued. To add more fuel to the fire, Nick later took to Instagram to share a picture of himself rocking a chequered shirt with bright yellow pants with a caption, "shooting something". Now, what on earth is going on at the Jonas Brothers' camp?! While we can't confirm the details of what's happening in the Jonas camp, we can tell for sure that they are currently chilling in Miami. Nick and Priyanka, who are such social media butterflies, have been keeping us busy with pictures of theirs on their handles. Is there another music video with the entire Jonas clan in the making? Nick and Joe aren't being secretive about their rendezvous. However, Kevin has been keeping a silent face throughout. The Jonas Brothers have definitely returned with a lot of vigour and strong fanbase. The brothers, reunited after five years and not just delivered a hit song, Sucker with a video to die for, but also found a sweet spot in the Billboard top 100 charts. This is the first time they ever reached such a feat as a band! Will the second song also create the same magic? We can't wait to see how that pans out!